The potato stew that I’m going to show you today is one of my go-to recipes when I don’t feel like eating any meat. Before Christmas, many Romanians choose to fast – some of us stop eating meat, others prefer to not eat any kind of food that comes from animals, including eggs, cheese, milk, and so on. 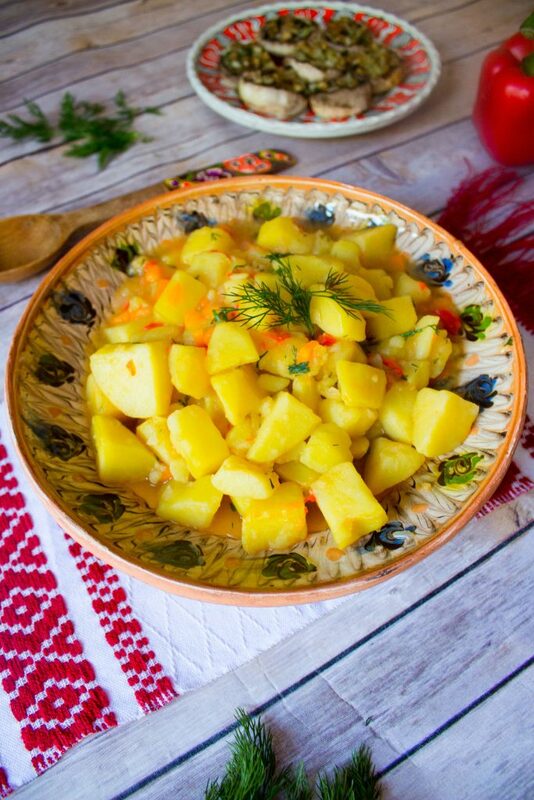 Whether you choose to fast or not, this potato stew is excellent as a main course or as a side dish. 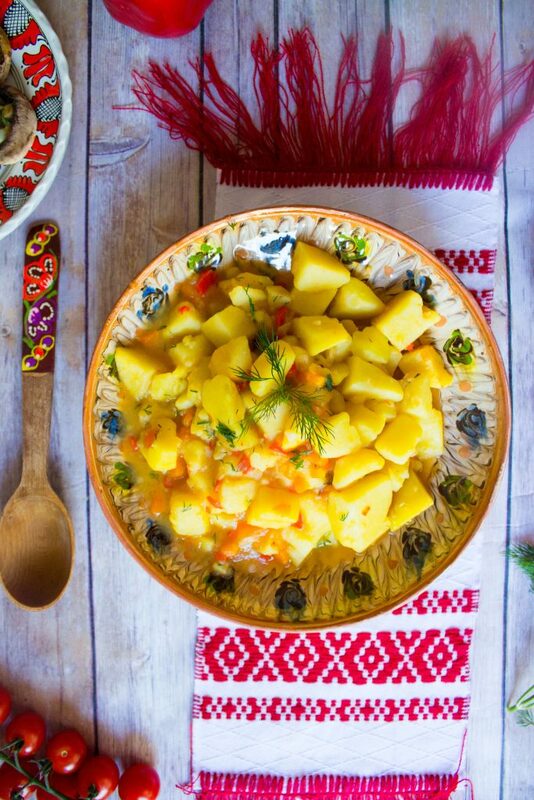 This Romanian vegan potato stew is perfect for fasting, especially when it’s accompanied by a delicious tomato and cucumber salad, or even better, lots of pickles! 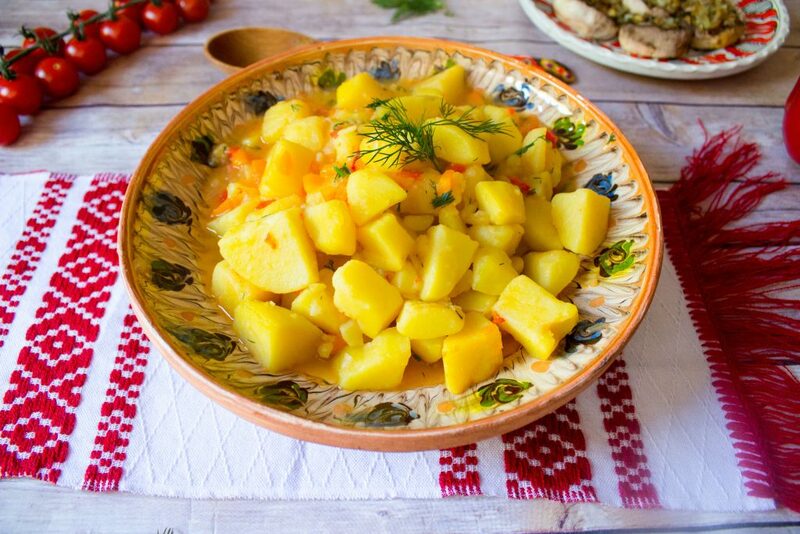 It’s really easy to make, but you’ll need to add a few ingredients which make the potato stew have the right consistency and also burst with flavor! So I started by finely chopping an onion, a red bell pepper and a carrot. 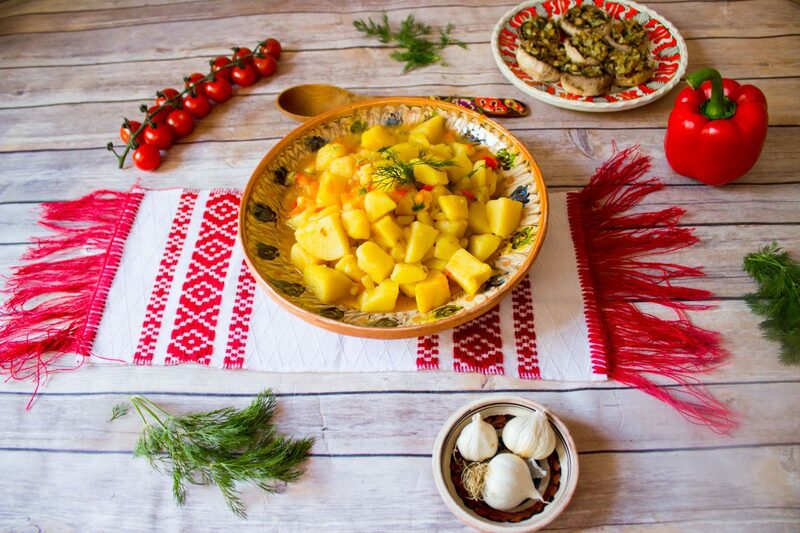 Some Romanians only add the onion, but I promise it tastes ten times better with these extra veggies! Use some potatoes which are good for boiling, the ones that you usually use for frying might not work as well. 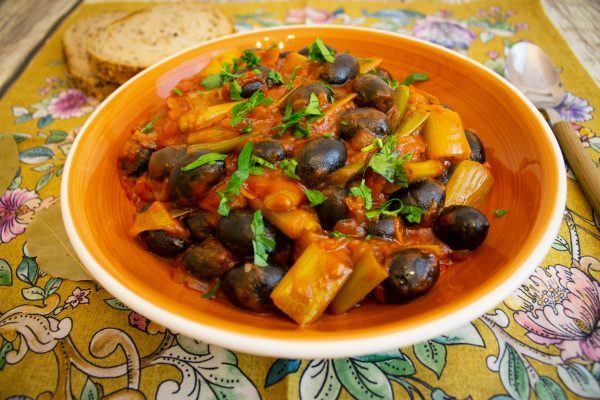 You can call this potato stew recipe vegan or vegetarian, and if you really don’t want to eat any meat, but you’re looking to add some protein to your meal, you can serve the stew with some stuffed mushrooms, like we did! I’ll post the recipe soon on the blog, so stay tuned! 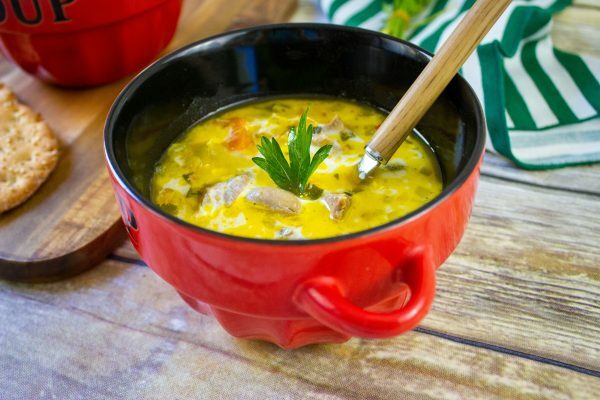 My grandmother used to make this potato stew all the time, and I remember she always added a lot of dill, which smelled heavenly once it was added to the hot potatoes in the pot. 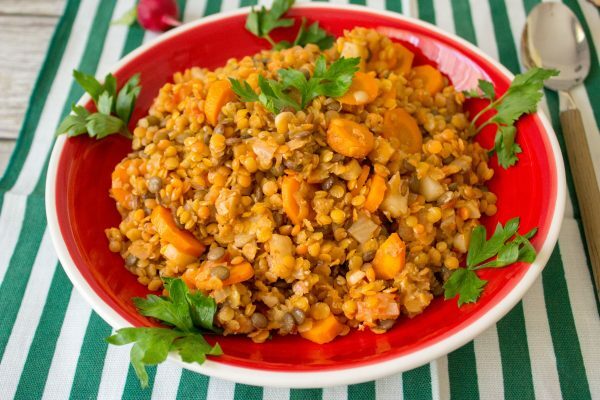 You can also add parsley, and don’t forget about the bay leaf and the paprika powder which must boil along with the potatoes – they’re the ones which make a wonderful, aromatic potato stew, amazing on a cold winter day. Finely chop the onion, the bell pepper and the carrot. In a medium pot, heat 2 tablespoons of oil and add the chopped vegetables. Fry them until they’re softened. Cut the potatoes into evenly-sized cubes and add them to the pot. Add the paprika powder, the bay leaf, salt, pepper and enough water to cover the potatoes. Let the potatoes boil until you can stick a fork in them, but they’re not too soft. Separately, mix the flour with the tomato paste, and gradually add some liquid from the pot until the flour is dissolved and you have a thin paste. Add this mixture to the pot with the potatoes and slowly stir to combine, without crushing the potatoes. Let everything boil for another 5-10 minutes. Chop the dill and add it to the potato stew after you have turned off the heat. 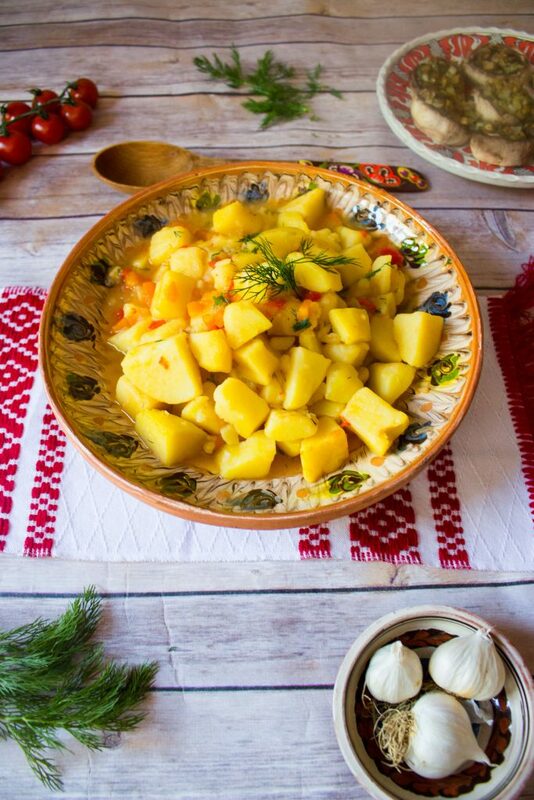 2016 Delicious Romania. All rights reserved.